eVal's free data and peer company analysis tools includes historic valuation multiples, historical share price data, company financial information, and Valuation Multiples by Industry sector reports, for use in investment and business valuations. In addition to the provision of financial data and peer company analysis tools, eVal provide investment and company valuations. eVal offer expert business, investment, and company valuations based on our proprietary data-driven valuation software and platform. Our investment and business valuation service is tailored for valuation professionals, business owners, investors and investment advisors. If you're a business owner and require a business valuation; or if you're an investor and require a private company valuation for your portfolio, please contact us directly regarding our business valuation service. eVal provide trailing peer company Enterprise Value ("EV") and Market Cap multiples, including EV/Revenue, EV/EBIT(DA), EV/Total Assets, and P/E. Users can retrieve valuation multiples at historical dates, by industry SIC Code, or by selecting relevant peer companies to create a user-defined peer group. Our outlier detection tool provides an overview of the peer group valuation multiples, so users can quickly determine and visualise industry trends, to detect and remove outliers from the underlying data. Our business valuation service is tailored to each client's individual requirements and valuation demands. Before performing a company valuation we talk to clients to better understand their precise needs, to ensure we provide users with a range of meaningful options, and to guarantee that each valuation is personalised, appropriate, and consistent with globally recognised methods of valuation. Our data-driven valuation service utilises eVal's proprietary valuation software and database of peer company valuation multiples to accurately determine a company valuation. Our market segmentation and data analysis allows us to appropriately reflect the market's assessment of value, adjusted for points of differences between the target company and the peer companies. For more information about eVal's business valuation service, contact us directly, or go to Business Valuation Services. eVal provide regression analysis tools relating to EV/Revenue, EV/EBIT(DA), EV/Total Assets, and EV/Tangible Assets multiples, where we regress each valuation multiple against various financial metrics, to determine whether there exists a linear relationship between the peer company multiples versus underlying peer company financial metrics. 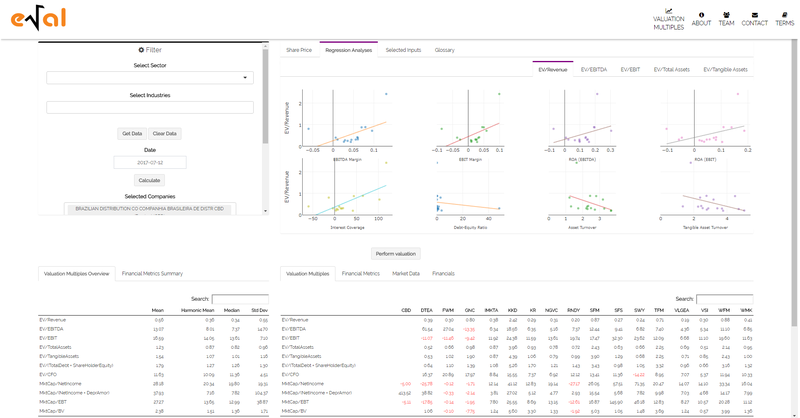 Our regression analysis tool allows users to quickly visualise industry trends, and remove outliers from the underlying data. Users can download our Valuation Multiples by Industry sector reports, which provide a summary of trailing industry valuation multiples, and the related summary statistics. Our Valuation Multiples by Industry reports are categorised by SIC sector. For more information, go to Valuation Multiples by Industry. We also provide historical share price data for each peer company. Users can retrieve share price data at historical dates, by industry SIC Code, or by simply typing or selecting the relevant companies. For a list of available industries, go to eVal SIC Industries; for a list of available peer companies and tickers, go to eVal Peer Companies. eVal is an independent financial technology startup focused on developing dynamic web-based applications and valuation tools, for use by Audit, Corporate Finance and Private Equity in business appraisals and investment valuations. In addition to designing web applications, eVal also provide free financial data, such as current and historic peer company valuation multiples and financial metrics of listed comparable companies. eVal is focused on providing practical tools and accessible data for use by valuation practitioners within Audit, Corporate Finance, Private Equity and Alternative Investments. Our free data and analysis service includes the provision of historic enterprise value multiples and peer company analysis tools for use in investment valuations, business valuations, and equity valuations. In addition to providing business valuation tools and free peer company multiples and related financial data, we also offer an indicative valuation service based on our propriety software - for more information, contact us. eVal provides free valuation multiples by industry or company, for use in business valuations and investment appraisals. We offer free data downloads for registered users – our data download service includes enterprise value multiples such as EV/Revenue and EV/EBITDA, plus free market cap multiples such as PE ratio, and Market Cap/Book Value. Our data includes related financial data and prevailing valuation metrics. 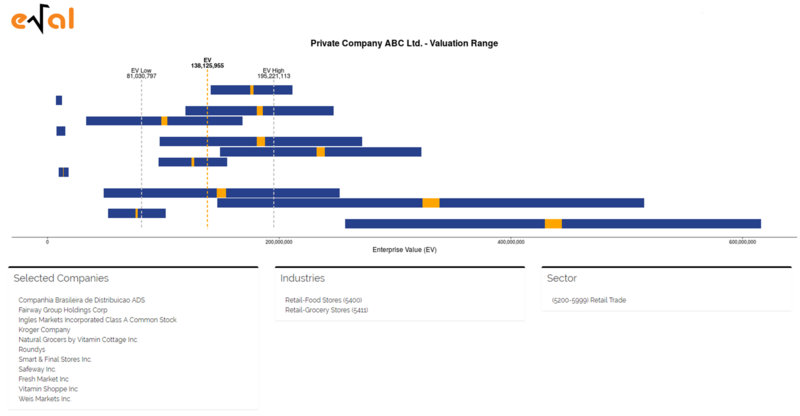 In addition to our free valuation multiples data, eVal provides an industry and company analysis segment, which includes regression analyses to enable practitioners to determine if/where there exists a meaningful relationship between peer company multiples versus various business and company financial metrics. eVal has developed a web-based business and enterprise value calculator, which harnesses automation, server processing and the power of predictive analytics to determine accurate business, equity or investment valuations of private and/or unlisted companies. 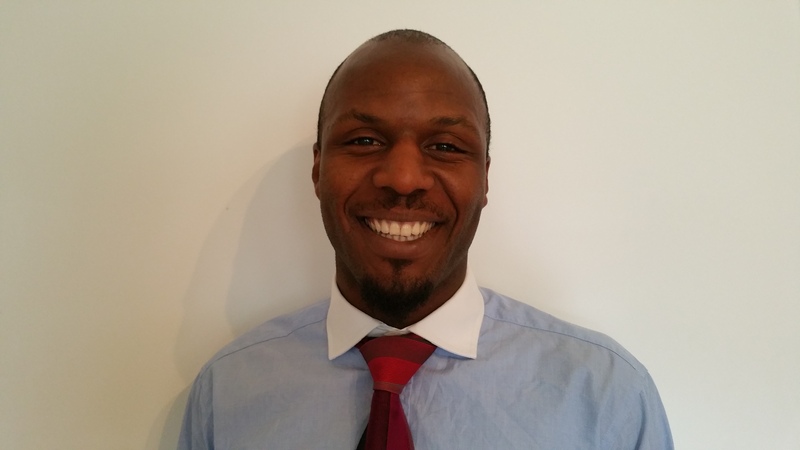 CFA charterholder with 10+ years valuation experience. Noah founded eVal to harness the power of financial technology to create automated valuation reports and build scalable client-focused valuation tools and web-based applications. 2018 eVal, a division of DuD Ltd. Registered in England and Wales; Company no. 08763740.